Imagine scores of the nation's largest employers have announced $1,000 bonuses, wage hikes, and employee investments in direct response to a Democratic tax overhaul. And then imagine that Republican Speaker Paul Ryan—who has already called the tax overhaul "Armageddon" and "the worst bill in the history of the United States Congress"—dismisses that money for working-class people as "crumbs" and "so pathetic." The New York Times would go with "For Top Republican, Four-Figure Bonuses Are ‘Crumbs.'" Washington Post would do "Democratic Tax Reform Is Bringing Millions of People $1,000 Bonuses. Paul Ryan Just Called It Crumbs." MSNBC host Stephanie Ruhle's scolding of Ryan as Ali Velshi feverishly nodded beside her would be fabulous. "You know what, Ali? My mother voted for Donald Trump, and she would like that money!" Ruhle would exclaim, perhaps whipping off her glasses for effect. The thing is, you don't have to imagine anything I've just written. See, there have been bonuses and wage hikes for workers as a result of tax reform. The only difference is Republicans passed that bill, and Nancy Pelosi (D., Calif.) was the one who called it Armageddon, the worst law ever—take that, Fugitive Slave Act!— and made that "crumbs" remark on Jan. 11. And yet, from the same media that guffawed at every gaffe from Mitt Romney, there's been silence. Outside of conservative media outlets, I found no coverage. I didn't even find one about Republicans "seizing" on Pelosi's remarks or "lashing out" after she had made them. And on television, while Fox News unsurprisingly made hay of the comment, their cable counterparts didn't think it worthy of coverage. The only reference on CNN came on Jan. 15 when conservative commentator Carrie Sheffield threw in a broadside at Pelosi during a discussion about whether Trump's "s—hole" statement about African countries was racist. On MSNBC, the sole reference came on Jan. 15 when RealClearPolitics reporter Caitlin Huey-Burns said Trump was stepping over the GOP's 2018 platform with his inability to avoid controversy. "They have Nancy Pelosi on record calling these bonuses ‘crumbs," she said, before moving on to how Trump was distracting from Republican messaging. Pelosi has since repeated the line about the money for workers being a "crumb," as has Senate Minority Leader Chuck Schumer (D., N.Y.). Rep. Debbie Wasserman Schultz (D., Fla.) said she didn't see $1,000 going very far for most people. And still, crickets from the mainstream press. 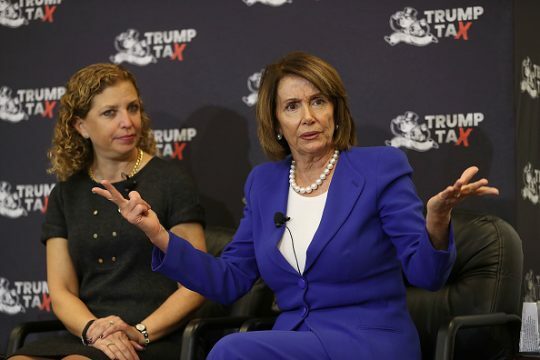 UPDATE: 9:00 A.M.: The Palm Beach Post alerted me to its article about Pelosi's remarks on Jan. 25 dismissing the bonuses. This entry was posted in Politics and tagged CNN, Fox News, Media Bias, MSNBC, Nancy Pelosi, New York Times, Washington Post. Bookmark the permalink.